What St. Michael's people accomplished in the next twenty or twenty-five years forms a record almost incredible in these days when the Irish immigrant with his peculiar attachment to the Church has well-nigh disappeared. Yet it attracted little attention, it received but scant notice now and then in the columns of the diocesan weekly, it was the work of a quiet, obscure group; and the material results of these efforts and sacrifices were not in themselves worthy of a great measure of admiration. But all things considered it was a glorious triumph, in a small scope not unlike that naturally inexplicable conquest made by twelve poor men and their followers in the dawn of Christianity. For one thing, they were hated with a pitiless, implacable hatred, a hatred which had become deeper and blacker after the frenzy, for the bigots of Kensington believed their own lie that the Catholics had been the aggressors not only in the riots but also in the trouble over the Bible. In the schools, the shops, the market-places, in the mills and factories, everywhere, the parishioners of St. Michael's were subjected to annoyances and discriminations. It was now very difficult for an Irish Catholic to find employment in Kensington, for almost invariably an applicant with an Irish name would be asked his religion. What other racial group would have persevered in planting the Faith anew in so cruel an atmosphere? There was the matter of the debt. Today when so many parishes are burdened with an indebtedness of six figures, a total of ten or fifteen thousand dollars on the unpleasant side of the ledger would very likely be smiled at contentedly. But to this congregation it must have seemed an insurmountable obstacle shutting the way of progress. They faced the necessity of raising the impossible sum of ten thousand dollars to pay for what no longer existed before they could begin again at the beginning. Most of the families of the Kensington colony - and this colony was the main body of parishioners, had been the principal support of the church - were impoverished, for what they had saved by frugal living had gone into the homes destroyed by the Nativists. For a while, a long while for some of the families, no one was earning. So it is a mystery how they managed even to keep life in themselves. In the light of these conditions what they did for God and the Church becomes a sacred epic, which should not merely be kept as a cherished tradition of the parish, but should be made known to all, an inspiration to Catholics everywhere, and a rebuke as well to those whose attachment to the Faith is lukewarm. Here, then, in the dark days of the summer of 1844 and in the darker days of the severe winter that followed, was the Catholic body reduced in numbers and for the most part destitute, but carrying on with heroic patience and determination. And such was the devotion of these immigrants that with all the hardships they had to endure, with the future of their own families so uncertain, their common worry, the question which weighed oppressively on their hearts, was: would Father Loughran survive the ordeal? He was worn and wasted, and moved about wearily but with pathetic willingness, he who was still a young man, in his early thirties. The plight of his people and the darkness of the outlook for the parish preyed on his mind with a most baleful effect upon his weak body. Those bloody days of May which had brought out the latent heroism of the man had also taken a heavy toll of health. In fact he had been rather sickly almost from the time he left his native land, and his first years of priestly labor in the country districts of Pennsylvania had certainly not benefited him. Let us see what his history is up to this point. He came here from Ireland in '33 or '34 and entered the theological school of the old seminary on Fourth Street. He was ordained at St. Mary's October 1st, 1837, by Bishop Kenrick. His first appointment was to the Church of Saints Peter and Paul at Beaver. After a few months he went to St. John the Evangelist's at Bellefont, where he had to live in the wretched little sacristy, for the Catholics were too few and too poor to provide a residence for their priest. This charge carried with it the duty of attending several missions, one at Lewistown, another at Clearfield, another at a settlement near Carthaus Creek, and of visiting occasionally the French colony in Clearfield County and other little groups in widely scattered villages. 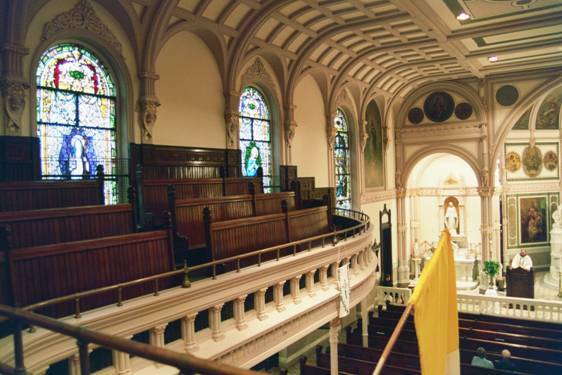 Late in 1838 he went to St. Patrick's, Harrisburg, as assistant to Father Pierce Maher, and then, early in '39, to Christ Church at Chambersburg. Here he had the only trouble with parishioners of his career, and it was not of his making. The seven trustees were in a surly and rebellious mood over the removal to Bedford of the Rev. Thomas Heyden, who today would be styled a live-wire, and took an instant dislike to the frail, quiet priest whom the bishop sent in his place. Father Loughran did everything in his power to conciliate them, and when he found his efforts were of no avail informed the bishop of conditions and was transferred to St. Dennis' in Haverford Township. He remained at this church until 1841 when he was made assistant rector of St. Michael's, Kensington. This too was a trying appointment, particularly after Father Donaghoe's departure. For two months he was alone, then at the beginning of 1844 Father Dominic Forrestal, who had just been ordained on Christmas Eve, came to help him. In Daniel Mahony's historical sketch of St. Stephen's Parish, Nicetown, it is said that Father Forrestal was the first priest to serve this church, and that he was succeeded in May, 1844, by Rev. William Loughran. The fact of the matter is that in the second week of January of this year the bishop issued an order that St. Stephen's, just dedicated on New Year's Day, was to be attended on the last Sunday of every month by one of the clergymen of St. Michael's; and in pursuance of this instruction the two priests alternated in going there. Father Forrestal was changed to St. Mary's before the riots, but for two months after-wards Father Loughran continued to go to St. Stephen's, that is until Rev. Hugh Lane was given the appointment shortly after his ordination - after whom came the Vincentians. It has already been stated that Father Donaghoe had returned. But he formally resigned in this summer of '44 and Father Loughran was duly made pastor of the afflicted congregation with Father Philip A. O'Farrell as assistant. The priests were probably living at this time in the sacristy of the rude, little chapel built in four days, for it was not until December that the trustees rented for their use the house of Nicholas Crangle on Second Street near Phoenix at the rate of $130.00 per annum. The people of St. Michael's have always had an extraordinary regard for their priests. It is a tradition with them, carefully cultivated by every generation and handed down as their most sacred contribution to the spiritual welfare of the next - not, it must be admitted, without some chafing at times under the arbitrariness to which even the priestly flesh is heir. Some of the priests have received more of affection than others; none more than Father William Loughran. He was loved; it seems, from the very day of his arrival in the parish. Simple, humble, easily approached, always kindly, he was the type of spiritual father to whom the Irish Catholics give their hearts with a sweet, childlike faith. He was plain in appearance; had not a great amount of learning, preached commonplace sermons, enlivened only by his sincerity, and these defects, if they may be called such, but brought him nearer and made him dearer to his flock. But what stirred them most profoundly was his patient ministering in spite of his physical frailty, his willingness at all times to listen to them, his attentiveness to the sick. His condition grew steadily worse through the winter. The parishioners became thoroughly alarmed, and as medical treatment had not helped, urged him to go back to Ireland for a while. He was loath to leave them in their distress, although he knew it would be impossible for him to carry on much longer; besides he had no funds, and would not have a collection taken up for this purpose. The trustees solved the financial problem, tendering him a sufficient sum as "an advance of salary" - God knows how they raised the money - and the fervent pleas of the whole congregation overcame his reluctance to leave his post. So Father Loughran sailed for his native land some time in March, 1845. Father O'Farrell was administrator in his absence. There was an improvement in the state of things in the colony that spring, and before the summer was out nearly all of the men had steady employment. Some had gotten handlooms again and found manufacturers who would give them a regular allotment of work. With the first brightening of the prospect the Catholics of Kensington began to think of rebuilding their church. They would do nothing for their own comfort while their Sacramental Lord was housed so poorly. The temporary chapel, swept and garnished, was yet offensive to their piety, and besides it was too small, now that many parishioners of the outer sections who had shunned Kensington were attending again. At the Sunday Masses a considerable portion of the congregation had to kneel outside whatever the weather and exposed to the ridicule of passing bigots. The matter was discussed at meetings of the Board. Now in March, 1846, the case of St. Michael's Corporation vs. the County finally came up in court, and the trustees were so sure that a favorable verdict would be given since the church was under the protection of the authorities when it was burnt, and as an indemnity - $6,468.98 - had already been paid to Father Donaghoe for the destruction of the property of his community, that they appointed a committee to consult the bishop on the subject of rebuilding. Then, to encourage them further and fill their hearts with joy, Father Loughran returned in May in much better health. The lawsuit dragged. But the Board was able to borrow money on the probability of its favorable conclusion to pay off old debts, and besides a small amount of insurance was received. So on Sunday, August 23, 1846, at four o'clock in the afternoon. Bishop Kenrick laid the corner-stone of the new St. Michael's. He was attended on this occasion by several of the clergy and a body of students from St. Charles' Seminary. After the usual ceremonies the procession moved to the graveyard where a platform had been erected in the pleasant shade of its trees and where the banners of the parish organizations - Sodality, Confraternity, Beneficial Society and Library Society - were massed. Here Father Sourin delivered the sermon. The collection amounted to $710.00. The Catholic Herald remarked in an editorial: "The hundred, and the fifty, and the twenty, and the ten dollars of the rich man were not contributed, but the dollar and fifty cents of the humble swelled the amount as they do on every occasion." The lay trustees at the time of this magnificent move were: Michael McGill, Patrick McBride, Isaac Mullin, Daniel Hickey, Andrew McMenamin, and John Murray. They would serve, with the exception of Isaac Mullin, until the summer of '49; Daniel Hickey, much longer. The new church was to be a reproduction of the old on the foundations of the old. An architect was not engaged, but Father Loughran directed the work and showed surprising knowledge and taste. He departed here and there from the plan, most notably in the facade, in which he enlarged and beautified the great doorway, and constructed bases for towers which would be added later. Day after day he acted as superintendent, giving orders to the workmen, even lending a hand sometimes, moving about with no regard whatever for his personal appearance, and little for his safety. The work was speeded as much as possible so that the church could be made ready for services before the coming of cold weather. At the end of the first week of October the walls had been built and the rafters laid. Everybody was happy over this progress. But on the following Tuesday a terrific gale swept Philadelphia, and at the height of the storm the rear wall and the rafters fell. The collapse weakened the north and south walls to such an extent that they would have to be torn down almost entirely. It was practically the destruction of another church. Was ever another group so sorely tried? Had God abandoned St. Michael's congregation? Was there no efficacy in their prayers, their sacrifices? First they had been stricken by the violence of men, and now, before they had recovered, by the violence of the elements. They could not know it, but the most terrible blow, the great tragedy, was shortly to befall them. There is a mystery in all this, the mystery of the working of Divine Providence. We shall understand in some measure after death. What we see now is that God tests the strong severely. It is a striking fact that the Faith of some people, particularly of the Irish, has been deepened and beautified in persecution and adversity. Father Loughran never faltered. The next day he had his men working harder than ever. In a few weeks the walls were rising again. On Sunday, February 7, 1847, the church was dedicated by the Very Rev. F. X. Gartland - soon to be the first Bishop of Savannah. He also sang the Solemn High Mass with Father Goodenough as deacon and Father Kenny (now assistant in place of Father O'Farrell) as subdeacon. Father Loughran served as deacon of honor to Bishop Kenrick, who presided and preached. The collection was almost ^1,000.00. In the afternoon there was another sermon by Father Sourin. At this time the famine in Ireland, which reduced the population by three millions, was at its worst. Two weeks after the dedication, a collection was taken up at St. Michael's for the relief fund, and the parishioners, almost hopelessly in debt both as a congregation and individually, gave $305.00. Philadelphia sent eight vessels loaded with provisions. The corporation took plunge after plunge into deeper debt. A young artist, Silvano C. Martinez, then a resident in the City, had been engaged to paint the altar-piece. It was finished and set up in April - a representation of the Crucifixion on a canvas fifteen feet by ten. It received high praise from connoisseurs of the day, particularly for the delicacy of coloring and the beauty and dignity of the countenance of the dying Savior. Through the many alterations which the edifice has undergone this painting has kept its place of honor over the main altar. A lot adjoining the parish property, south on Second Street, was purchased from Francis McCreedy for $1,500.00. A fair had been held in the Chinese Museum in the spring, but had simply brought a little ready money. St. Michael's Corporation would quite surely have gone down in financial ruin if the case against the County had been lost. But in December, 1847, a judgment was given in favor of the parish for $27,000.00. It was less than the cost of the bare building which had been destroyed. The lawyers' fees amounted to $3,750.00, and other expenses incidental to such a trial had to be paid. The parishioners were jubilant none the less, and the lay members of the Board, breathing a great sigh of relief, realized they had forgotten something in their worry, and promptly voted a resolution expressing their gratitude to Father Loughran for the splendid service he had rendered in the building of the new church. New contracts were let out immediately for the finishing of the edifice. It was plastered and painted and fitted with pews. Furnaces were installed, and an organ of their own, which latter item alone stood at $1,600.00. The towers were erected in October, '48, and the next spring a rectory was built below the church on the lot acquired from McCreedy. It had been a hard, glorious advance. But neither priests nor people were content to rest for a while. There was a want which they all felt most keenly. The children of the parish had to attend the public schools, which were still offensively Protestant. The riots had this effect on the school question that the Catholics kept quiet for fear of another outburst, while the injustice continued unabated. Catholic children heard their religion attacked and ridiculed, and were made to feel that they were merely tolerated in these institutions which the taxes paid by their parents helped to support. As early as 1792 Bishop Carroll had emphasized in a pastoral letter the necessity "of a pious and Catholic education of the young to insure their growing up in the faith." The first Plenary Council of Baltimore had declared "it absolutely necessary that schools should be established in which the young may be taught the principles of faith and morality, while being instructed in letters." The Catholics of Kensington knew the attitude of the hierarchy on the subject of education. They frequently heard their own bishop urging the building of parish schools. They themselves had painful experience of the need with their children subjected to the influence of proselytizing teachers in the public institutions. They were somewhat ashamed they had not yet provided one. But it had been utterly impossible. The church was the first need in their eyes, and in building and rebuilding it they had accomplished something of a miracle. They had not been, were not now, in a position to support a school; that is why they tore down the temporary chapel, which might have been converted into a rude schoolhouse, and divided the site into burial lots. However they started a school fund. Quite suddenly the colony commenced to grow again. Irish immigrants pouring into Philadelphia heard the story of the renewed progress of St. Michael's, and lost their dread of Kensington. The fact of the new church and the likelihood of finding employment in this industrial section together proved a compelling attraction to many of them. At first there seemed little promise of help to the parish in the coming of these half-starved, destitute refugees from the Isle of Death. But they began to contribute with their first earnings. The regular revenues of the church increased steadily. The corner-stone of St. Michael's Parochial School was laid at the end of the summer of '52. While the work went on a class of boys was formed and conducted in the basement of the church under the direction of a male teacher. The building - it extended south on the new ground from the rear of the rectory - was opened for classes in September, 1853. The teaching staff consisted of six ladies and one gentleman. The Catholic Directory gave an enrolment of from eight hundred to a thousand pupils, but this cannot be credited. There were probably about five hundred. In 1854 the stroke of a pen put the parish within the limits of the City; or rather it brought the City out to St. Michael's. This was the signing of the Consolidation Act by Governor Bigler. It made the City and County conterminous. The passage of such a measure had been agitated constantly since the anti-Catholic riots, which so tragically emphasized the evil of the condition of separate governments, but had been prevented by selfish politicians. In the first elections of this Greater Philadelphia Robert T. Conrad was the Knownothing candidate for the mayoralty. He was listed on the ballot as a Whig, but the Whig Party was then virtually defunct. It was known by everybody where his strength lay. He was successful, receiving 29,507 votes to 21,011 for Richard Vaux, Democrat - and the official figures of that election remain as indisputable evidence of a prevalent hatred for Irish Catholics, for Knownothingism was purely and simply a revival of Native Americanism. Father Loughran and his people were made very anxious. What if their new church, the rectory and school were destroyed in another outbreak of violence? Every week in the Herald they read accounts of criminal excesses committed elsewhere by the Knownothings. There had been the riotous demonstrations against Archbishop Bedim, Apostolic Nuncio to the Court of Brazil, in many cities which he visited. There were the attempts to burn Catholic edifices in various parts of the country, in Texas, New York, and the New England states. There was the destructive attack on a church at Newark, N. J.; another at Manchester, N. H.; another at Lawrence, Mass. ; still another at Brooklyn, N. Y. The church at Massillon Ohio, was burned to the ground, and at Sidney, Ohio, and at Dorchester, Mass churches were blown up with gunpowder. On August 5, 1855, Louisville, Ky., was turned into a shambles by the butchering of Irish Catholics, and the day came to be known as Bloody Monday. Throughout the months they read of these assaults, and here in Philadelphia they saw the Knownothings in possession of the government. Thus they were oppressed with anxiety when otherwise the thriving condition of the parish would have given them a reward of happiness. St. Michael's territory had been lessened gradually: St. Anne’s had been founded at Port Richmond; St. Joachim's, at Frankford; the Assumption, in what had been the District of Spring Garden; and St. Malachy's, out in the old South Penn. But West Kensington was rapidly becoming a thoroughly Catholic section, and notwithstanding the contraction of the parish boundaries, the number of parishioners had grown greatly. There was a debt, of course, but not sufficient to cause worry. At Second and Jefferson Streets stood a group of buildings of which any parish could well be proud. The Irish Catholic colony had fought through to a magnificent victory - and now instead of rejoicing, their hearts were heavy with fear. But their work would not be swept away again by a wave of passionate hatred. No frenzied mobs armed with musket and torch would come to drive them out. There was no storm brewing in Fishtown. Their church and homes were safe. Philadelphia had had enough of rioting, and Knownothingism only froze the bigots into a harder attitude, could not inflame them. But St. Michael's Parish was on the eve of a dreadful disaster. Swiftly, unexpectedly, as it were by a bolt from the blue, this group already so tried was to be struck and cast into the deepest depths of human misery. They would look out their windows and see something worse than rioting Nativists; they would see the dead bodies of their children being brought in.